Jerk Chicken is an amazing dish I love to eat, but have always been a bit intimidated to make myself. This was mainly because I didn’t have my own recipe for it, and when you go looking for Jerk sauce recipes, there are many variations out there. 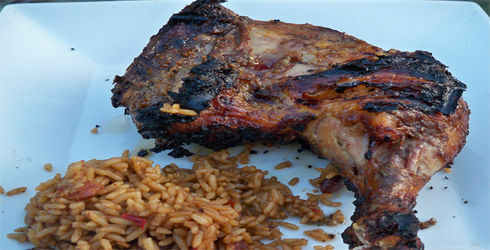 It seems as though everyone has their own special Jerk Chicken recipe, that varies slightly from each other. After much searching I came up with my own Spicy Jerk Sauce recipe, made from a combination of recipes I found. I think you’ll agree that this is a good contender with authentic Jerk Chicken that can be found at Jamaican restaurants. Summary: I think you’ll agree that this is a good contender with authentic Jerk Chicken that can be found at Jamaican restaurants. To make the Spicy Jerk Sauce, mix all the ingredients together in a food processor or blender and puree. Don’t add any water, if you’re having trouble getting it all blended, just keep turning off the blender, stirring up the mixture, and trying again. Eventually it will turn into a semi thick puree. Now taste it. It should taste pretty salty, but not too unpleasant. You want this to sort of brine the meat as it marinates. It won’t taste too salty when you eat it with the meat, it will taste great. You can also now throw in more chilies if you like more heat. If you do think it is too salty and sour, try adding in a bit more brown sugar until things are good and balanced. Take you chicken pieces and place in a large container or zip-lock bag, and add the jerk sauce to the chicken. Marinate in the refrigerator for at least 24 hours to 2 days, turning occasionally to coat. Grill chicken over medium heat until thoroughly cooked. Discard marinade. * Start with a small amount of the hot peppers and add more later if you think it needs it. This way you can control the heat to your liking. If you can not find Scotch Bonnet peppers, you can substitute with habanero peppers. Traditional Jerk sauce is made with Scotch Bonnets though. You are encouraged to add more of your favorite seasoning, leave out any you aren’t fond of, and substitute one for the next to make a variation of this recipe. Copyright © The Hungry Wife. © 2019 The Hungry Wife. All Rights Reserved.